Public Sector trade unions in the city representing city council workers are launching a campaign against the enormous cuts to our public services that will be voted on in the Council meeting next month. Pictured is a copy of the advert that has been placed in the Coventry Observer newspaper. A meeting has been arranged for all trade unionists who are interested in being part of the campaign which will be held on 23 January at 7pm in the Koko Building in Spon End, Coventry. A letter to councillors, demanding that they refuse to implement the cuts in our city, can be downloaded here: Fighting the Cuts (2). Please circulate and let the councillors know how you feel. These cuts will mean our services will disappear unless we fight for them. 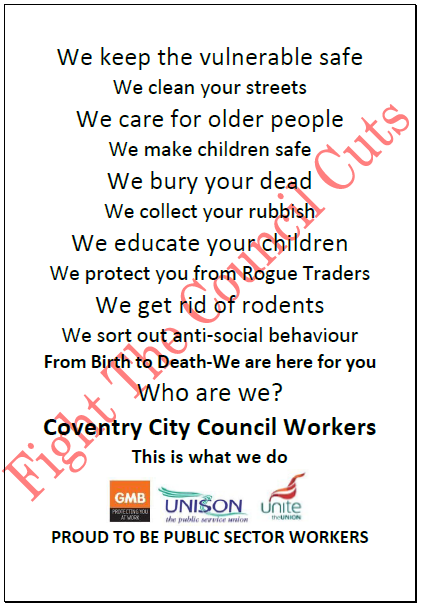 Preparations are being put in place for a demonstration in Coventry on Saturday February 23rd against the cuts before the vote in the council on the 26th February. There will be leafleting in the city centre on Saturday 19th and 26th January at 11am outside the Methodist Central Hall. This entry was posted in Employment Law, Events and tagged Employment, Spending Cuts. Bookmark the permalink.